Why Are Hitters Swinging At More Bad Pitches? Today, instead of telling a story using numbers, I’ll let the numbers do all the storytelling. I think in this case that they have something to say. The table below comes from Jamie Moyer’s plate discipline stats. While I am interested in Moyer in general, it’s not his stats here that jumped out at me. Instead it’s the major league averages, which appear in the orange-colored rows. The first two columns certainly stand out. While overall swing percentage isn’t too far off from previous years, both O-Swing% and Z-Swing% have moved moved a bit. This year hitters are swinging at 28 percent of pitches outside the zone, a nearly three point jump from 2009. The number does move around a bit, dipping as low as 16.6 percent in 2004. On the other side, hitters are swinging at fewer pitches inside the zone as last year, 63.8 percent against 66 percent from last year. That number appears to increase to some degree all the way back to 2002. 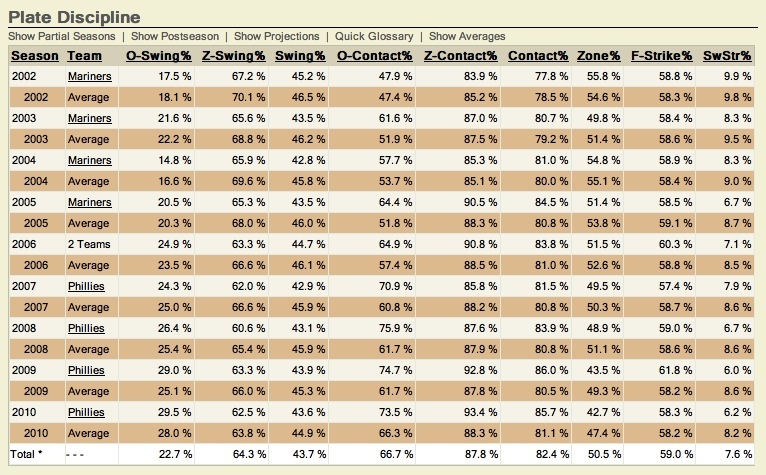 We’re also seeing much more contact on pitches outside the zone. I’m obviously wondering why we’re seeing this discrepancy. Why are hitters swinging at pitches outside the zone more frequently than in the past? This seems like a good question to crowdsource. I’ll present a couple of ideas, and you guys can build on them. It’s certainly something I’d like to hear more about. 1, This is just an early season thing. They say hitters get better as the weather warms. Maybe that has as much to do with them getting into a groove — hitters are getting closer to the 250 PA mark — as it does the weather. 2. It’s just part of the natural cycles of the game. Hitters were more patient earlier in the decade. Maybe now they’re starting to be more aggressive. 3. Related to No. 2, and perhaps a bit to No. 4, pitchers are exploiting a weakness and are making hitters chase more. 4. Pitchers are just hurling nastier stuff. Hitters are having a hard time adjusting to tougher breaking and off-speed pitches. I’m not sure how you could go about proving this one, so it’s probably an afterthought, if that. 5. The criteria for pitches inside and outside the zone has changed. 6. Just blame the umps. Again, I’m not really sure if this is something that we’ll see continue all season, or if No. 1 more fully explains it. I’m also sure that there are many, many more possible reasons. I’d like to hear them, though. We hoped you liked reading Why Are Hitters Swinging At More Bad Pitches? by Joe Pawlikowski! Perhaps the focus on Walks being more valuable these days, players are watching more pitches. Pitchers might know this, and throw them more strikes, which they still take while waiting for their pitch to drive. From there, batters are watching more strikes and therefore getting into less hitters’ counts than before, being forced to swing at 0-2, 1-2, 2-2 pitches that are near the edge or outside of the zone to protect? I don’t know, just trying to write up a story of some kind. Maybe the ‘wait for yours’ mantra has gone too far as to get hitters behind in counts more often? I’m sure someone could look at the number of these types of counts (and when the outside the zone swinging) is taking place. Expanding on the above: it may not be that the ‘wait for yours mantra’ has been taken too far. Perhaps the approach being taken is still optimal (rather than “too far”), but just results in these events more often. To be fair, I clearly remember I was at my worst as a hitter when I wasn’t being aggressive (back when I played). I mean it was partly due to a fear of the strikeout, which we all know now is stupid, but some guys just struggle when down in the count. I’d rather a guy never walk vs. never hit. /waits for the attack due to being overly general. 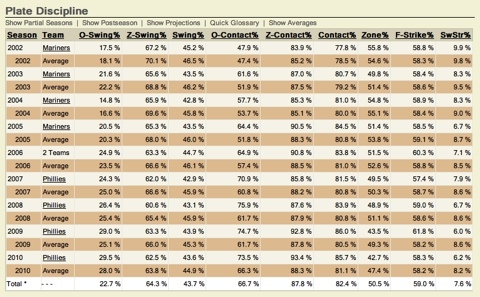 Looking closer, despite the fact that they’re swinging at these things, the Swinging Strike % has been decreasing, while the O-Contact and Z-Contact % has been increasing. So while they’re swinging at them more, they’re making contact. Could that indicate more defensiveness from being deeper in the count on average? Like I said, I don’t know. I, too, am not at my best when I’m not being aggressive. A .270 OBP is good, right? If this were a good explanation, I think we would see a rise in f-strike rates. Perhaps hitters sit on first-pitch fastball strikes? So the change in pitchers’ counts are coming more so after the first pitch? Like I said, just throwing things out there.